Just when I thought I’d seen it all, heard it all, along comes The White Soldier. Actually, he’s been patrolling right here in my neighborhood in East Jerusalem and I didn’t even know it! 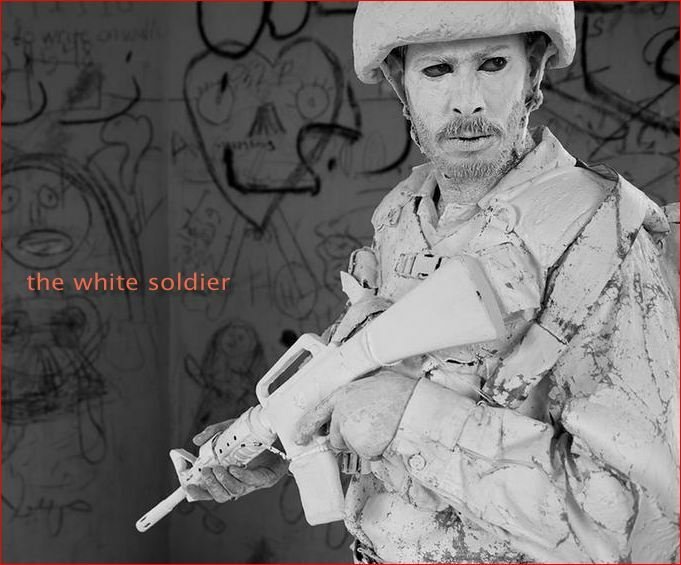 The White Soldier is performance artist (and real-life combat veteran) Yuda Braun who teams up with colleagues and appears on the streets in costume consisting of full military battle dress — with one major variation. They’re, well… white. All white. Braun has a particular goal in this, as he catches people off-guard and elicits their varied and unpredictable reactions: It is, he says, to spark some kind of reflection on the militarized and militaristic society which the State of Israel has become (or perhaps always has been). A video profile and interview (1-1/2 min.) is found on YouTube, HERE. One more article, from a year ago, which escaped my notice at the time. It deals with a series of artistic, awareness-raising events focused on Jerusalem’s 1948-67 “No Man’s Land” which skirted the Old City on the western side, around to Damascus Gate. Braun, in his White Soldier persona, was a participant. Yuda is not the member of some mountain troupe in winter uniform who has got lost. He is an artist who has put only one colour on his palette, to loosen tongues and make people react. “Are you the angel of death?” he is asked by an Orthodox Jewish child, just one of the many questions the white soldier receives. He is Yuda Braun, a young Israeli artist aged 26 who has decided to make people reflect in the street. This is why he puts on his soldier’s uniform and goes up and down the streets of Jerusalem, takes up positions in the villages and cities of the Palestinian Territories in Israel, and patrols the Green Line established in 1967. There would not appear to be anything out of the ordinary about this, except that Yuda is completely white. White from head to foot: his head, hair and clothes are covered in paint, as is his helmet (a cyclist’s) and his weapon, a plastic M16. Synonymous with purity, peace or surrender, the idea of white contrasts with that of a soldier. Yuda wants this colour to oppose the concepts of security, control, struggle and oppression. Depending on moods, places and time of day, his encounters take place in different ways: midday at the Damascus Gate is completely different from a Thursday evening in Mamilla (the trendy area near the Old City) or from Shabbat in the ultra-Orthodox neighbourhood of Mea Shearim. Sometimes people stop, or stare at him, call him crazy, compliment him, take a photo of him, insult him, invite him for a coffee, attack him, dance around him, kiss him. Children are very often afraid of him, almost terrified. Although Yuda tries to look gentle and smiles, more often than not they are scared and run to hide in their mothers’ skirts. On the other hand nothing of the kind happens when they find themselves face to face with a real soldier, and it is this that annoys him. When he is asked if his act can be considered a provocation, he answers that, as in everything, it is a question of semantics. He is not trying to provoke, in the negative sense of the word. He simply wants to open a debate. Yuda does not have concrete solutions to give to the Israeli-Palestinian conflict, he does not wave flags or carry banners in the street. He is not a politician, he does not sit in Parliament and he defines himself as an actor. The Israeli and Palestinian territories are packed with history and emotions, just as complicated. Man has been fighting for this land for more than three thousand years. This is why soldiers are everywhere and Yuda has noticed that it is much easier for the population to ignore their presence. On the day commemorating the independence of Israel (last year it fell on 9th May), Yuda put on his costume. In the middle of the crowd that had gathered in the square of the town hall of Jerusalem, he stood like a statue for almost three and a half hours. Yuda says that it was an emotionally very strong moment and hopes that he got as many people as possible to start thinking. Sometimes though, the objective is completely missed. On the day celebrating the reunification of Jerusalem, someone congratulated him as the guardian angel of the city. It is with the police that the artist has his biggest problems. He has been arrested several times, and on two occasions his costume, worth about 400 euros, was also confiscated. He is questioned continuously; why are you doing this? What organization are you working for?… The police see a threat in Yuda. “They all have the same warmongering spirit, the police accuse me of threatening while it’s they who have the real weapons!” Yuda’s weapon is made of plastic, but the police still confiscated it, considering that nobody authorized him to patrol the streets. Today Yuda has a lawyer who helps him and watches over him. The authorities know him now and are no longer entitled to prevent him from putting on his artistic performances. Yuda wants the population to take responsibility and to make them aware of the current situation. Art, at times, can be more effective than many rhetorical speeches. Yuda is now busy finding volunteers to go on patrol with him and in as many different places as possible. Will the white soldier succeed in changing the colour of things? If you thought the recent “Pillar of Cloud” assault on Gaza was all about Israel defending itself, think again: Do you remember what sparked the sharp explosion of hostilities this time around? It was Israel’s eye-in-the-sky assassination of Ahmed Jabari, commander of Hamas’ military wing. Now, this fellow was no angel, BUT at the very time Israel’s leaders gave the order to take him out, Jabari had just received for his approval the text of a proposed, long-term ceasefire with Israel, an agreement he was expected to sign off on. The thing is, the Israelis knew all this — the indirect negotiations were being carried out with the full knowledge and approval of Defense Minister Ehud Barak (and presumably Netanyahu as well). One must ask, then: What the hell are these guys playing at!? And more to the point: Why did scores of Palestinians (and a handful of Israelis) — many of them innocent civilians — have to die? For what? Read the article from Haaretz, 04 DEC 2012. This entry was posted in Israel-Palestine Scene, Jerusalem People, Occupied Territories, Palestinians, Politics, VIDEOS and tagged 1948, Art, Gaza, Green Line, Huj, Jerusalem, military, Najd, Naqba, No Man's Land, Sderot, The White Soldier, video, Yuda Braun. Bookmark the permalink.